Gent-Sint-Pieters is the main train station of Ghent and is located approximately 2 km to the south of the city centre. There are regular train services to and from Brussels, Antwerp, Bruges, Ostend, and Kortrijk, alongside smaller towns. The easiest way to get to the Aula is by tram: tram lines 1, 21, and 22 have a stop at the front of the train station and will bring you to our doorstep in 15 to 20 minutes. Get off the tram at the stop 'Korte Meer'. Continue in the direction the tram is going for another 100 meters and then turn right, into Voldersstraat. See the website of De Lijn for the schedules of these tram lines. There is also a taxi rank at the front of the train station (turn right upon exiting the train station). Gent-Dampoort is a secondary train station of Ghent and is located approximately 1.3 km to the east of the city centre. There are regular train services to and from Antwerp, Bruges, Ostend, and Kortrijk, alongside smaller towns. Trains coming from Antwerp stop in Gent-Dampoort before continuing on to Gent-Sint-Pieters and beyond. Several bus lines go from Gent-Dampoort to the city centre. One of the more frequent is bus line 3. See the website of De Lijn for the schedules of the buses going from 'station Gent Dampoort' to 'Voldersstraat 9' (use these as starting and destination points). The Faculty of Law does not have parking spaces for visitors. Several public car parks are located in the vicinity, the nearest of which are 'Kouter' (P5), 'Centerparking Korte Meer' (P6) and 'Sint-Michiels' (P7). When entering Ghent, follow the directions to these car parks. Be advised that Ghent has an intricate system of one-way streets in use. a) Exit Brabantdam: go into Vogelmarkt, turn left into Koestraat, continue through Kalandeberg and Kalandestraat, then turn left into Voldersstraat for approx. 150 meters to the entrance of the Aula. b) Exit Korte Meer/Gerechtsgebouw/Veldstraat: turn right and follow the tram tracks into Korte Meer. After approx. 150 meters turn right into Voldersstraat. Turn left into Korte Meer and after approx. 100 meters turn right into Voldersstraat. Use the exit Onderbergen. Turn right into Onderbergen, go left into Jakobijnenstraat, continue through Hoornstraat into Voldersstraat. On September 23, 1816, Willem I, first King of the Netherlands, decided to establish one of three state universities of the Southern Netherlands in Ghent. A university that will accentuate the charisma of a thriving city with a growing economy and industry. Delighted by this decision, the city council decides to build the ‘Aula’. This palace of the university will not only serve to host all formal academic ceremonies, it aims to highlight the prestige of the new university, as well as the city of Ghent. The development of this prestigious palace was assigned to Louis Roelandt, a promising and upcoming Belgian young architect who was already well-known in the Ghent Academia and beyond. 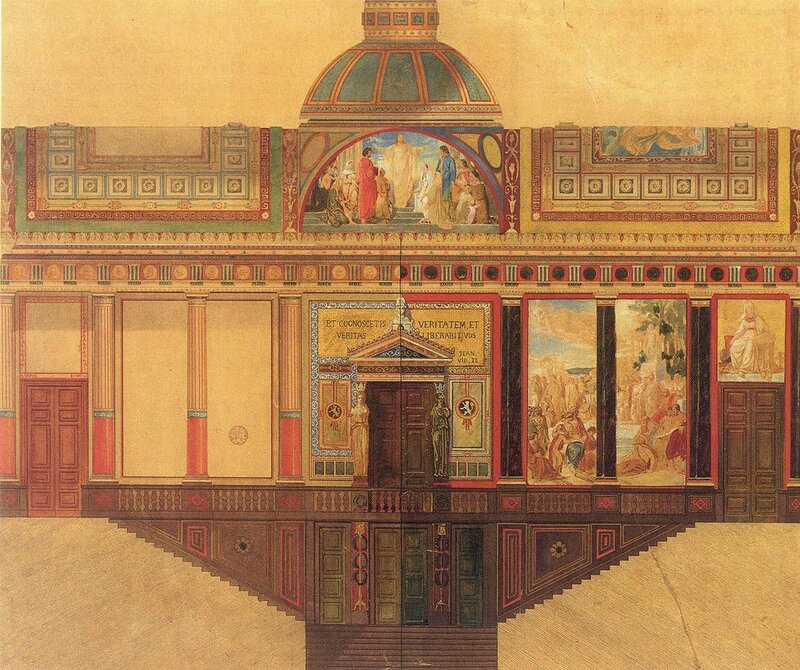 Roelandt designed the palace as a strict, neoclassical temple for the glorification of enlightened science. With its 8 columns and tympan, the front is inspired by the Pantheon designed to impress anyone passing by. The interior is equally impressive featuring an astonishing vestibule as well as the main ceremonial hall with a stunning plastered dome. To the present day, the Aula is used for various formal ceremonies, including the formal opening of each new academic year as well as the final graduation of new students. Its rich academic history, together with its ideal location in the historic city center of Ghent, make it the perfect setting to host the MOFSIM workshop.